With flavorful ingredients you can see and taste—and no added preservatives or artificial flavors and colors—Ready Meals are from brands you trust. Whether you’re in the mood for the classic Italian taste of Prego or the signature southwest flavors of Pace or the Americana flavors that Campbell’s is known for, you can have an easy and deliciously satisfying meal. Enjoy right from the pouch or in your own dish. 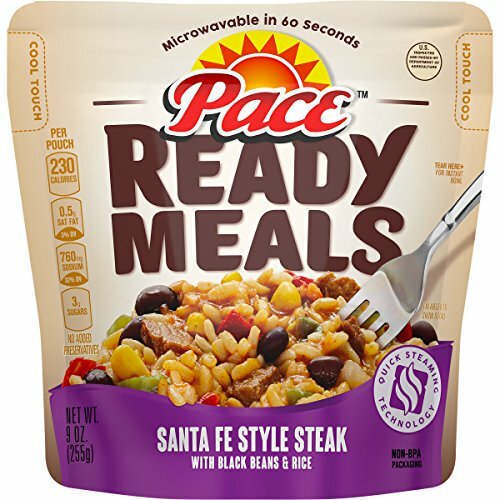 It takes just one minute to prepare Pace Ready Meals Santa Fe Style Steak with Black Beans & Rice. Made with sliced steak, black beans, corn and red bell peppers, there’s a little Santa Fe-inspired zing in every bite. Just pop in the microwave and enjoy bold southwest taste straight from the pouch. Delicious! If you have any questions about this product by Pace, contact us by completing and submitting the form below. If you are looking for a specif part number, please include it with your message.